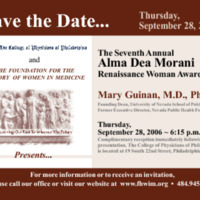 Dr. Mary Guinan, champion of disease control and prevention for three decades, was the 2006 recipient of the Alma Dea Morani Award. Currently Founding Dean of the New School of Public Health at the University of Nevada, Dr. Guinan had taken part in the historic effort to eliminate smallpox in Uttar Pradesh, India. Also, she is often credited with being one of the first doctors to identify AIDS as an epidemic. 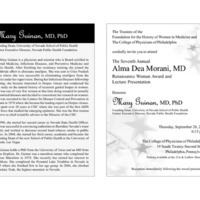 Dr. Guinan is board certified in Internal Medicine, Infectious Diseases, and Preventive Medicine in Public Health and holds a Ph.D. from the University of Texas and an M.D. from Johns Hopkins University. During her Infectious Disease fellowship training, she became interested in herpes viruses in women. She was one of the first women at that time doing research in sexually transmitted diseases and decided to concentrate her research on women. In her 22 years with the Centersfor Disease Control and Prevention in Atlanta, Dr. Guinan became a leading expert on hrpes viruses and studied the first cases of AIDS while serving on the original AIDS Task Force. She also was the first woman to serve as chief scientific advisor to the Director of the Center for Disease Control. Dr. Guinan is currently Founding Dean of the UNLV School of Public Health. She served as a Nevada State Health Officer and was successful in convincing authorities to fluoridate Nevada's water supply as well as worked to decrease second hand tobacco smoke in public places. Biography from the Foundation for the History of Women in Medicine website, here.